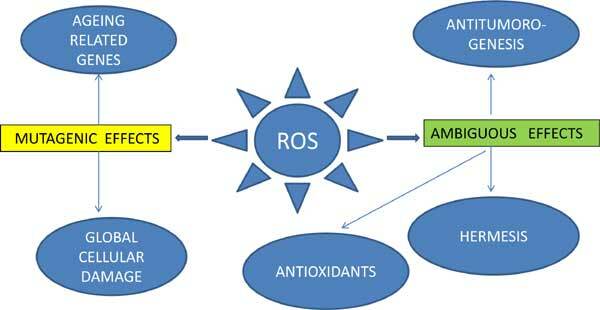 Famous Free Radical Theory (FRT) of aging, the 50th year anniversary of which is celebrated in 2015 postulates a crucial role of Reactive Oxygen Species (ROS) in aging. Still it is the most robust theory of aging as mitochondria ROS production (mtROSp) correlates well with four principal ‘‘rules” of aging being universal, endogenous, progressive, and deleterious. Vast number of experiments in different species prove mutagenic effect of ROS and their carcinogenic properties. So far, FRT stimulates the search of new pharmaceuticals with antioxidant activity. However, some recent experimental data and clinical findings render doubt to ROS as a principal senescence drivers and come in conflict with original version of FRT. Growth stimulating effects of ROS and their modest antitumor properties support these objections. One should remember that FRT is only one of the numerous theories of aging. Molecular mechanisms of senescence involve all living systems and numerous metabolic pathways which are also variable owing to the unique properties of individual genome and unique epigenetic modulations operating throughout the lifetime thus making aging a unique private matter. Universal theory of aging that incorporates and explains all known and suggested mechanisms of aging, is illusive. However, knowledge of unique peculiarities of individual genome, its feasible editing and efficient epigenetic regulation of metabolic pathways give a chance to postpone aging and extend period of active longevity. Aging, free radical theory, reactive oxygen species, systems genetic.